Get the most out of the Adaptive AUTOSAR platform. Adaptive software based on C++, running on a Linux-based POSIX OS, high-performance machines with multi-core processors, and a new AUTOSAR system architecture that is based on services: AUTOSAR Adaptive expands the AUTOSAR platform to meet the demands of the latest automotive trends. PREEvision helps you to get the most out of the Adaptive AUTOSAR platform and to expand your existing AUTOSAR systems and solutions with future-proof applications and ECUs. First of all, Adaptive AUTOSAR is an additional platform. AUTOSAR Adaptive will not replace AUTOSAR Classic. New solutions based on Adaptive AUTOSAR can be added to existing AUTOSAR Classic architectures. And mixed architectures will be the standard scenario to benefit from the strengths of both platforms: AUTOSAR Classic is optimized for the deeply embedded hard- and software of the classic automotive domains, AUTOSAR Adaptive offers the flexibility that, for example, car-to-car or car-to-x communication demands. 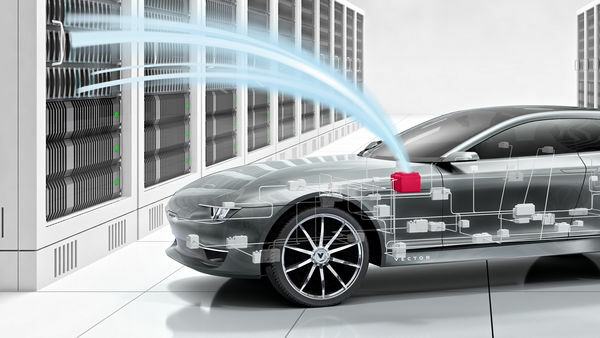 The Adaptive AUTOSAR platform meets the demands for connectivity in car. One of the most significant differences to AUTOSAR Classic: AUTOSAR Adaptive tears down the separation between design time and execution time. applications that communicate with services outside the vehicle. The AUTOSAR Adaptive platform allows the integration of new applications at any time. C++ is the language for AUTOSAR Adaptive Applications instead of C that is used in AUTOSAR Classic. C++ is optimized for performance critical and complex applications. Adaptive applications are executed within processes that are managed by the operating system, which is a linux-based POSIX system. If permitted by the configuration of the POSIX OS, processes can be added to or removed from the list of executables at any time. While AUTOSAR Classic serves deeply embedded ECUs, Adaptive AUTOSAR is optimized for high-performance computing. The ECU of AUTOSAR Classic is now called machine, supports multicore processors and may even be a virtual machine using shared hardware. The communication technology for Adaptive AUTOSAR is Ethernet exclusively, offering more bandwidth than legacy technologies like CAN. In short: Adaptive AUTOSAR is optimized to utilize both increasing processing power and faster communication. PREEvision provides multiple diagrams and a dedicated user interface to carry out all design steps needed for a system design based on AUTOSAR Adaptive. The design workflow for AUTOSAR Adaptive: from Adaptive Service and Software Design, to Network Topology and Machine Design and Ethernet Communication Design. Service interfaces modeled in class diagrams. To enable software updates and to allow new applications to interact with existing software, Adaptive AUTOSAR is based on a service-oriented approach. Service providers and service consumers can find and subscribe to each other and communicate via well-defined service interfaces. The definition of service interfaces with methods, properties, and events is one of the major tasks of the system design in Adaptive AUTOSAR. PREEvision offers dedicated diagrams and tables for the service definition. In AUTOSAR Adaptive, the service interfaces are implemented via software components: Software components have ports which are typed by the service interfaces. This works similarly to AUTOSAR Classic. SOME/IP is the standard transport protocol for the middleware in Adaptive AUTOSAR. To enable the middleware, for example, to recognize method calls or to send event information, the service interface and its sub-elements must be uniquely characterized with an ID. The deployment artifacts are automatically created by PREEvision based on settings of the service interface. For SOME/IP, the information to be sent via Ethernet can be serialized with transformer chains. The SOME/IP transformation describes how the data is encoded to be transmitted via Ethernet. In AUTOSAR Adaptive, the serialization code is generated based on the Service Interface description and default values. Additionally, fine granular modeling on the level of data types is also possible. In PREEvision, the transformation properties on both levels can be defined. The Adaptive Application represents the distribution unit of application software that is deployed to the adaptive platform. Application software developers pass the results of their work as an adaptive application to the integration workflow. The adaptive application itself is a set of executables. One executable contains the software components implementing the application. PREEvision provides a network diagram to model an Ethernet network with machines and switches and to connect the Ethernet network to the existing topology via gateways. The Network Topology Diagram supports the creation of the hardware topology. State chart to setup startup configurations. In Adaptive AUTOSAR, the adaptive software is executed on machines with microprocessors that may contain multiple cores. The process-to-machine mapping maps software components to cores in the microprocessor. Or the hardware may even be virtualized. Also: In Adaptive AUTOSAR, the adaptive software is executed on machines. The machine can either be a piece of hardware with microprocessors that may contain multiple cores. Or the hardware may even be virtualized. The process-to-machine mapping maps software components to cores in the microprocessor. Service instances represent the service interfaces on the communication layer. In PREEvision, the instances are created automatically including Ethernet clusters, VLANs, switch configurations or network endpoints. Also, the communication paths are created. The configuration of the service instances comprises the definition of parameters for the bus communication like SOME/IP identification of the service, the transport protocol (TP) and timing information for service offer and service search. Also, the IP addresses must be defined, like IPv4 or IPv6 addresses to indicate where the server accepts the method calls and where the server sends event messages to. In PREEvision, mappings between hardware and software can easily be created via drag and drop. Service discovery messages are exchanged between network nodes to announce and to discover available service instances. Service discovery configuration organizes the communication needed to offer services on the provider side and to search for and to subscribe to services on the consumer side. The AUTOSAR Adaptive Explorer allows to easily switch between the different abstraction layers and model parts. Though AUTOSAR does not prescribe a defined order, PREEvision offers a workflow comprising all steps needed to model a complete AUTOSAR Adaptive system. The AUTOSAR Adaptive Explorer focuses on the model parts needed and provides all necessary tables and editors to execute for the actual step. The explorer allows you to easily change between the different abstraction layers and model parts, starting from the service definition through software and hardware to the communication aspects. Integrating adaptive applications, machines or service instances into an AUTOSAR Adaptive platform is called deployment. The deployment can be configured either during design time, and it can also be configured during runtime of the AUTOSAR Adaptive platform. These updates, upgrades or additions to an existing system are one of the main advantages of Adaptive AUTOSAR compared with the classic platform. All information needed to deploy machines or adaptive applications are collected in so-called manifests. Contains the information required for the actual deployment of an application on an AUTOSAR Adaptive platform, for example, execution dependencies, startup configurations, mode declarations, etc. Contains machine-specific configurations for one deployment procedure independent of any service instances or applications, for example, machines, cores, network endpoints or mode declarations. Contains the service instances, the service discovery settings, the mapping of the service instances to the machine and optionally the mapping of service instances to the software component ports. This format is used at deployment time. For collaboration with partners, you can also export design information like, for example, a Service Interface Description or create your own custom export. And you can import existing data into your AUTOSAR Adaptive model in PREEvision. PREEvision is part of the Adaptive AUTOSAR tool chain. While PREEvision supports the Adaptive system and application design including deployments, CANoe can be used for simulation and tests. With the DaVinci Adaptive Tool Suite, you can develop the actual adaptive application. PREEvision as a part of the Vector AUTOSAR tool chain works with CANoe and the DaVinci Adaptive Tool Suite. In this webinar our product manager demonstrates the different steps of the PREEvision’s design workflow for AUTOSAR Adaptive. Get to know how PREEvision simplifies the creation of an Adaptive AUTOSAR model with the support of the AUTOSAR Adaptive Explorer and other helpful tools. Get to know the complete E/E engineering solution and its comprehensive functions in our new PREEvision brochure: classic and service-oriented architecture development, requirements management, communication design, safety-related system design, AUTOSAR system and software design as well as wiring harness development. PREEvision offers a comprehensive modeling language to describe all aspects of e/e systems. All engineers involved in the development process find tailored diagrams and editors for their work. And yet, all work in one integrated tool. Development of software and hardware architectures incorporating many AUTOSAR concepts. AUTOSAR compliant design of Ethernet networks and clusters including the corresponding communication.